This week I’m sketching a chair that I could use for a snooze, or sit backwards and do some… sketching. It’s not for the tsunamiball, it’s just for fun. I think I could attach this frame work to an unu elektroroller so that I could ahve some support on my back when I ride the scooter around town. 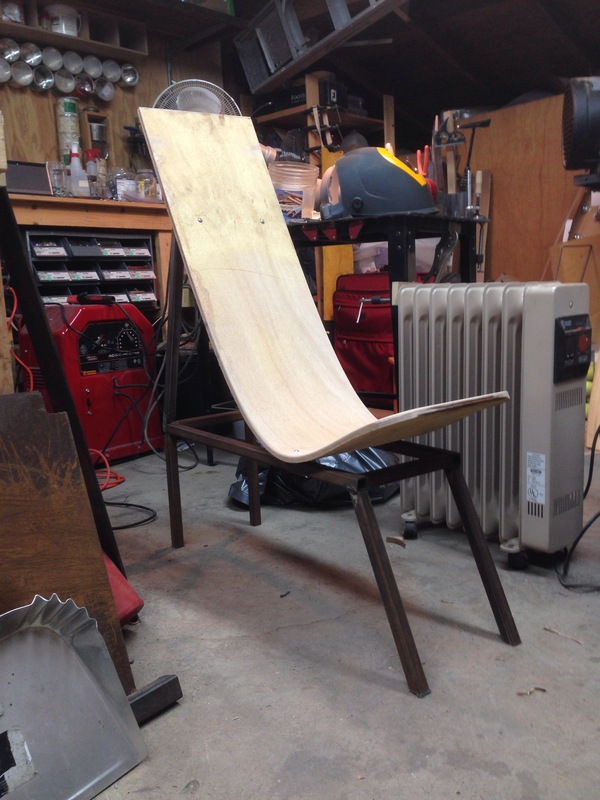 I was cleaning up the shop last week when I found the first steam bent chair I made. It was a good glue up but it was too narrow so I stashed it away and retooled for a wider chair body. So now I’m using that scrap bend and some 1 inch square tubing a bought from the local scrap yard and just playing. The form is simple if not a bit clunky, but it takes up very little floor space and is remarkably comfortable just as it is. The seat is connected to the steel frame with 4 bolts. A little more sanding and some floor-safe inserts for the legs and I’ll be done. More pictures to follow. ← Safe: just installed the second jack cradle. Thanks for the update. Each time you send an update I spend even more time watching your other posts. Enjoyed seeing your father, we never met in person but as he was the one who started your interest in Chinese cooking, from which my family benefited, gotta love him! Hope you and all your family had a joyous Christmas and wish you the best in 2016. Hi there, really amazing idea. im from seattle, been living in japan 5 years now, and next month im moving to fukushima too! wow thats amazing! im going to iwaki city. Welp it will be fun regardless. Also trying to take the japanese drivers test, woo so much fun! actually it kind of is! Chad, thanks for the kind words, and good luck on the driver’s test. I’ve heard its super tough.